Wow, things are really heating up for Tylenol. 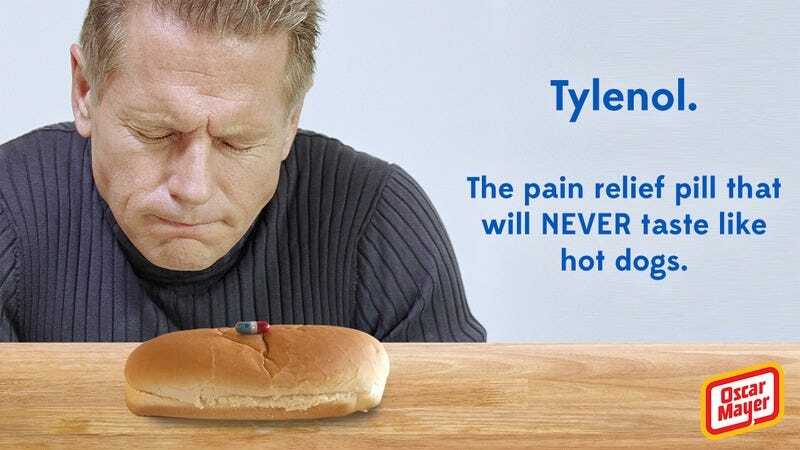 Meat company Oscar Mayer released a brutal new ad campaign this morning slamming Tylenol for not tasting like hot dogs. From TV to print to web, the commercials take shots across the aisle and mercilessly rip into Tylenol for having a bland flavor that does not taste anything like the cold cut company’s signature meats. Oof. Tylenol must be reeling right now. The campaign, which cost Oscar Mayer hundreds of millions of dollars, threatens to destroy Tylenol’s reputation among both hot dog lovers and ballpark frank enthusiasts. The company pulled out all the stops during its brutal campaign today, from buying costly prime-time commercial slots during NFL games to starting some absolutely cringe-worthy Twitter wars with Tylenol. Yikes. Needless to say, Tylenol’s marketing department better come up with a response fast, because its brand definitely does not look good right now. In the war between Oscar Mayer and Tylenol, there’s no doubt that Oscar Mayer scored a huge victory today.